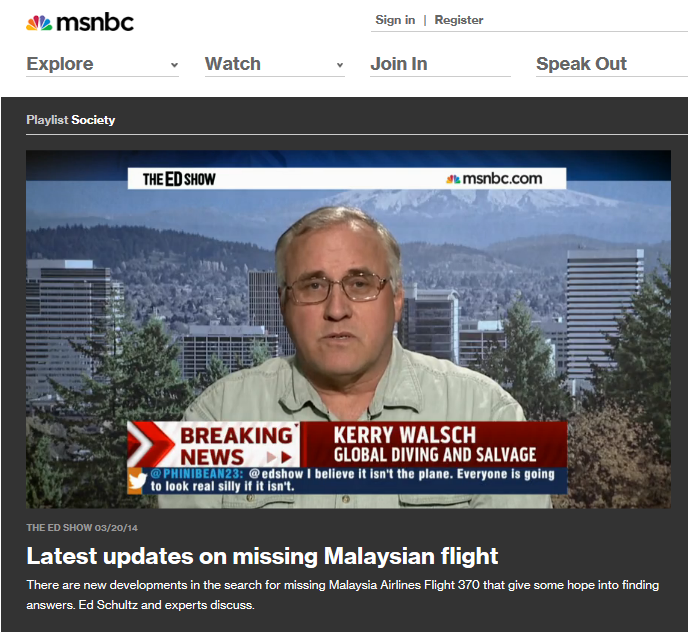 MSNBC Interview about Malyasian Flight 370 - Global Diving & Salvage, Inc.
MSNBC recently contacted Global with questions regarding the recent reporting of possible debris sightings from a satellite from Malaysian Airline Flight 370. As industry experts on challenging salvage operations, Global’s Kerry Walsh, Salvage Master, was interviewed by Ed Schultz of The Ed Show to shed some light on the difficult situation of locating and retrieving wreckage at depth. See the entire segment on MSNBC.